It’s been an interesting ride for Bellevue’s 0/8 Seafood Grill and Twisted Cork. In 2006, chef and radio personality Dan Thiessen hooked up with Matthew Bomberger to open a splashy, dual-named restaurant and wine bar adjacent to the Hyatt Regency. July 2009 brought word of a second venture: Stir Martini + Raw Bar, just off the Hyatt’s lobby. That announcement coincided — not incidentally — with a partnership shakeup that had Bomberger severing ties with Thiessen. Cut to last month and another big shakeup: it was out with 0/8 and its fine-dining menu, in with Twisted Cork, rebranded as a Northwest bistro — until last weekend, when the whole shebang was shut down. “The bottom line is that the revenues weren’t there to support the restaurants,” explains Bomberger, who shuttered Twisted Cork Saturday followed by the Sunday closure of Stir. The Twisted Cork at 0/8, photographed shortly after it opened. Losing a “name” chef like Thiessen in a difficult economy may have hastened his restaurants’ demise, Bomberger admits. As for the professional differences that led to the dissolution of their partnership, “What happened, happened,” he said, noting last he’d heard, Thiessen was working at a bistro in Normandy Park. Furthermore, “from a standpoint of attracting and maintaining customers, it’s difficult for a sole owner to keep up with the deep pockets of corporate establishments,” like those lining the streets of Bellevue. “They’ve got brand-name recognition and better purchasing power than I have.” His local investors, he said, will be “last on the list” when it comes to dealing with his debt. 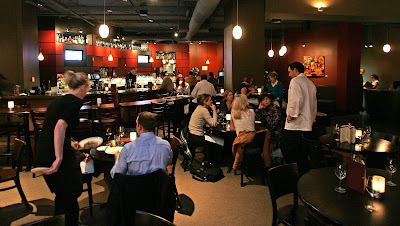 Twisted Cork and Stir are among 23 “sit-down restaurants” in Bellevue Place, Bellevue Square and Lincoln Square — part of The Bellevue Collection, said Jennifer Leavitt, vice president of marketing for Kemper Development Company. The full “collection” is 45 eat-and-drinkeries strong, and includes a heavy mix of corporate outfits. Among them are familiar names locally (Daniel’s Broiler, Blue C Sushi/Boom Noodle), nationally (P.F. Chang’s, The Cheescake Factory) and internationally (Canada-based Joey and Earls), but only a handful of one-restaurant independents (including Ristorante Luciano and Pearl). Asked about plans for the Twisted Cork and Stir sites, Leavitt refused to comment — for now. Stay tuned.